Just when I thought I had all of my sewing and stitching kits corralled together, I found another one in a random drawer. 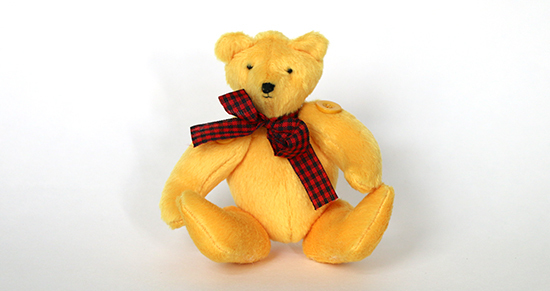 This one is a Make Your Own Teddy Bear kit by Alicia Merrett, circa 1995. 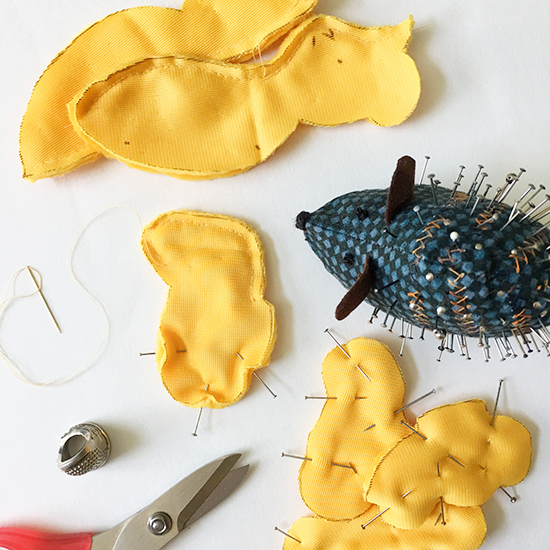 The kit, which is in a box that is about 4 x 4 x 2 inches (10 x 10 x 5 cm), contains almost all of the materials necessary to make a small teddy bear: an instruction book, faux fur, matching thread, polyester filling, buttons for joints, beads for eyes, contrasting thread for facial features, and ribbon for a bow. The instruction book is a full 50 pages, with everything from the cutting and sewing instructions to a brief history of the teddy bear and a birth certificate for the final creation. The instructions were clear and the teddy bear went together quickly and easily in my spare moments over the course of a couple of days. The biggest challenge was that the bear itself is small, so some of the pieces were fiddly. The completed bear is about four inches (10 cm) tall while sitting, and 5 1/2 inches (14 cm) while standing. Although I opted for a classic ribbon bow around the bear’s neck, the instructions included patterns for a knit scarf and a sewn shirt or vest as options for dressing the bear. There are even directions for a little sleeping bag. As has happened with every other stuffed animal I’ve made, the shape of my bear is different from the kit’s photos. This may be due to edits between when the photo sample was made and the instructions were completed, but I prefer to think go it as a bit of the maker’s personality being imparted to the plushy. And now, with this kit complete, all of my remaining kits are stored together. I think.